The Prakriti, a society devoted to environment conservation at the Post Graduate Government College for Girls (PGGCG), Sector 11, Chandigarh, observed Akshay Urja Diwas. The function organised to mark the occasion was sponsored by the Chandigarh Renewable Energy Science and Technology Promotion Society (CREST). 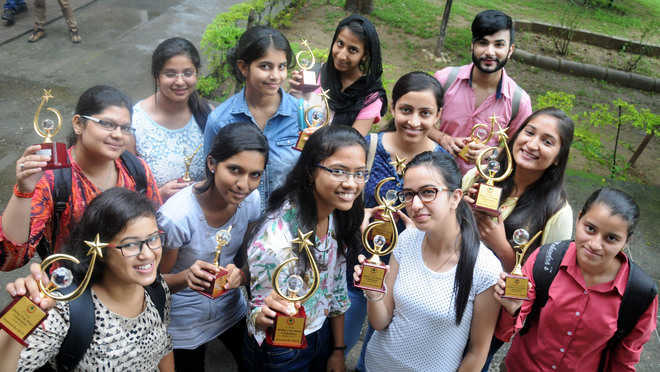 Various Inter-college competitions, including slogan writing, poster making, and PowerPoint presentations were held on the occasion. As many as 90 students from 14 colleges of the tricity took part in the programme. In her address, College Principal Anita Kaushal, who was also the chief guest, highlighted the importance of energy resources and appreciated efforts of society members and motivated them to carry out such activities to play a constructive role for the betterment of society. The students, along with the faculty members, took a pledge to conserve energy. The function concluded with a prize-distribution ceremony. Meanwhile, students and and the faculty at the Department of Physics and Environment Science at the PGGC-11 observed the day by holding a poster-making competition. More than 200 students took part in the competition. College Principal Dr JK Sehgal awarded the winners and participants for turning up in huge numbers to mark the day. Chandigarh: GGDSD College, Sector 32, organised the TEDx, a globally recognised event, on Saturday. The event witnessed a variety of renowned speakers-from progressive bureaucrats to young entrepreneurs. The theme for the event was “Ideas Worth Spreading”. The event brought brilliant minds together to discuss unattended issues and innovative ideas. Eminent speakers such as Vikram Sridhar, actor and founder of Tahatto, spoke on the power of stories in an outsourced world and Raul Rodriguez, a neuroscientist, talked about the deceptive interpretation of the Islam. While Dhananjay Chauhan, president of the Saksham Trust, talked about the struggle faced by the LGBT community. Vivek Atray, a progressive bureaucrat, orator and writer, chose to speak on what it meant to be an Indian in a globalised world. Mohali: Chandigarh University (CU) has signed a MoU with a leading consulting, technology and business process management organisation, ValueHR. Under the agreement, the company will set up an R&D and data analytics centre at the university where business management students will undergo skill enhancement training so as to prepare future managers for the corporate world, especially the financial service sector. Dr RS Bawa, Vice-Chancellor, CU, and Jaiprakash Singh Hasrajani, co-founder and CEO of the firm, signed the agreement.